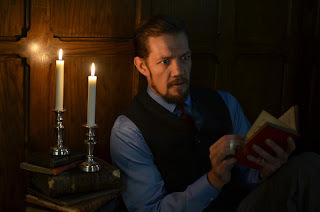 I’ve been going back and forth trying to make excuses for Classical Actors Ensemble’s latest offering of two plays in repertory - Christopher Marlowe’s Doctor Faustus, and William Shakespeare’s The Tempest - and I just need to stop or I’ll never get this review posted. There are a lot of things that work really well in both plays. And if I’m honest, there are also a lot of things that don’t. The interesting thing is that they’ve got two marquee names this time out. Though Marlowe’s version of the Faust legend may not be widely known or performed, the basic story of the man who sells his soul to the devil in exchange for a better life is fairly common knowledge. And The Tempest is, quite deservedly, one of Shakespeare’s more well-regarded and oft-produced plays. So Classical Actors Ensemble doesn’t have the usual hard sell to make with half of its double feature, with people asking “What’s that other one about?” The symbiosis between the two productions here strikes an odd balance - in Doctor Faustus, we’ve got a strong lead performance in a more problematic script; in The Tempest, we’ve got a strong script where the lead actor is struggling. Michael Ooms is the main reason to see Doctor Faustus, as directed by CAE Artistic Director Joseph Papke. The character of Faustus has to hold the stage, often on his own, for a large stretch of the story. In lesser hands, the role would be less compelling to watch. Ooms acts the heck out of this thing. He’s also got able support from the two right-hand men of the tale - Lucifer’s assistant Mephistopheles (Art Moss, with a delightfully menacing Southern accent) and Faustus’ own valet Wagner (Joe Wiener), who also serves the role of chorus and narrator for the story. Wiener is the perfect choice for all the verbal heavy lifting that frames the play. If there are things the play doesn’t let you do onstage, you want an actor with Wiener’s chops to describe it for you - he can get the full impact from any words you care to give him. The weird thing about Doctor Faustus is what Faustus ends up selling his soul for. Ostensibly, the man has crammed his brain with the sum total of human knowledge - science, law, religion, medicine, you name it. It’s his longing to know things humans cannot (or should not) know, to do things that humans cannot (or should not) do, that drives him to make this deal. He gets two dozen years of Mephistopheles serving has his lackey and partner in crime in exchange for his eternal damnation when the bill comes due. But then what does he do with it? The challenge, of course, is to take so cerebral a longing and turn it into something theatrical that you can perform onstage. This unfortunately makes Faustus out to be a merry prankster - he lifts the pope’s robes, he travels to distant lands in the blink of an eye, he gets a woman grapes out of season, he makes a guy who ticks him off sprout horns from his head, he conjures the spirit of Alexander the Great as a party trick to delight an emperor, he summons Helen of Troy so he can make out with her. We don’t witness a lot of the expansion of his mind. Also, the stakes are a little hard to fathom for a modern audience. Since we don’t get to see hell, or any of Faustus’ eternal suffering, it’s difficult for an audience to wrap their head around the notion of an unpleasant afterlife. Sure, the idea of what happens to Faustus, given the description of the remains of his body that they find scattered around the house, doesn’t sound pleasant, but it seems like “Well, horrible way to die, but it’s over now.” Except, Faustus’ suffering is only beginning. He’s in for an eternity of torment, and that’s not something that’s manifested onstage. Now, it’s also not in the play, so you can’t blame the production for that. And death is always a pretty horrible price to pay - but in this case it’s only the downpayment. Then there’s The Tempest. Director Daniel Ian Joeck has the gift of one of Shakespeare’s best stories here. There’s magic and romance and revenge and redemption and reconciliation. It’s a great mix and all the subplots, even Shakespeare’s friggin’ clowns (which tend to grate on my nerves), are all woven together in one big sprawling entertaining adventure. The play also has some of the playwright’s very best poetry. Shakespeare was operating at the top of his game in The Tempest. Prospero (George Muschamp), the former Duke of Milan, was chased into exile with his infant daughter when his power-hungry brother Antonio (Robb Krueger) took over his dukedom. Landing on a secluded island, Prospero raises his daughter Miranda (Marika Proctor) to be a lovely young woman, while also sharpening his magical powers, fed by the knowledge in his beloved books. He enlists the unruly natives of the island like the deformed Caliban (Joe Wiener) and spirits like Ariel (played by the trio of Neal Beckman, Morgan LeClaire, and Marci Lucht) to serve his needs, so everything is going quite well (unless you’re Caliban or Ariel, of course). Then fate brings Prospero’s brother Antonio near the island, on a ship returning from the foreign wedding for the daughter of Alonso, King of Naples (Randall J. Funk). Prospero uses his magic to conjure a storm that splits up the wedding party and shipwrecks them on different parts of the island, but without a scratch on them. Even the ship itself remains perfectly intact, and the crew, including the Boatswain (Michael Renner) and the Mariner (Samantha Veldhouse), are resting peacefully for a while on the other end of the island. Antonio gets washed up along with the King, the king’s brother Sebastian (Michael Ooms), and the king’s trusted but overly enthusiastic counselor Gonzalo (Art Moss). Knowing a thing or two about usurping power from one’s brother, Antonio advises Sebastian that if he kills his brother, then he could be king. Yikes. Meanwhile, on another part of the island, the king’s son, prince Ferdinand (Rick Miller), fears he’s the only survivor of the shipwreck (just as everyone else thinks he must be dead). The loss of his family is brightened by meeting young Miranda, who is equally charmed by him. Prospero, among other things, needs to monitor their courtship so young love doesn’t get too out of hand. Ariel helps Prospero keep an eye on all parties involved in the different corners of the island, and it turns out Prospero needs eyes in many places. Because Caliban has found another couple of shipwrecked buffoons, the king’s fool Trinculo (Ethan Bjelland) and the king’s butler Stephano (Nicholas Nelson). A fine trio of drunkards, they plot to kill Prospero and take over the island for themselves, so it’s a good thing they’re so hilariously inept at executing their plan. Prospero and the hardworking Ariel, who’s been promised their freedom for a job well done, bring everyone together when the time is right and see that all scores get settled. A series of random things work really well in this production of The Tempest. The manifestation of Ariel onstage is probably the best hybrid use of masks and puppetry across the two productions (more on that concept in a moment). The three actors voicing Ariel, all clad in their own willowy pastel outfits, take an animal skull mask and keep it hovering over a billowing expanse of fabric that sprouts arms which can be either beautiful or menacing, depending on the task Ariel has at hand. The rules of how and where Ariel pops up get a little fuzzy sometimes, but when Ariel’s going full out, it’s quite a sight. One new common design element (for CAE) incorporated in both plays is the use of puppets and masks, both designed by Chava Curland. The elements themselves are captivating, but the mask work seems better integrated here than the puppets (the one notable exception being the mask/puppet hybrid of Ariel in The Tempest). The masks make for a good inhuman indicator - whether they be for the Seven Deadly Sins and other supernatural creatures of Faustus, or Caliban in The Tempest. The puppets are more problematic. In Faustus, their big moment is the good and bad angels hovering around Faustus trying to guide his behavior. Given that Ooms is taller than your average human, and the puppets are smaller, it gave off the (I expect unintended) vibe of a children’s show for a moment. Ooms is very committed to the concept so it almost works. The use of puppets in The Tempest is a headscratcher. When Prospero is rolling out the backstory for his daughter Miranda, he starts picking up puppets to represent the various characters in his story. But at the same time, the audience is watching the actors playing those roles appear, so we’re already getting a dumbshow to reinforce the names of the characters and help us follow along. Not sure why the puppets are necessary on top of that. Then later when those same characters are making their way around the island, they are carrying their puppet doppelgangers with them and having them converse. There’s no payoff ultimately at the end of the show, the use of puppets just stops partway in. However, on the plus side in The Tempest in addition to Ariel, Marika Proctor and Rick Miller as young lovers Miranda and Ferdinand are delightful. You believe they’re really smitten with one another, they’re very cute together (and I’m not just saying that because Miller spends an entire scene with his shirt off, although, shallow as it may be to admit, God bless actors with gym memberships). And even though I have a problem with the repeated insertion of song breaks in The Tempest slowing down its momentum (which it struggles with quite a bit anyway), I have to confess that the ensemble’s onstage rendition of “Sea of Love” was wonderfully charming - in large part because it wasn’t just a song break, there was something going on. When one of the singing spirit characters flirts playfully with one of the sailor musicians, his bumbling response with fingers ever so slightly stumbling over his stringed instrument was adorable. The production as a whole could have used more genuine human moments like that. Because, as you’ll note, the things that worked for me about The Tempest were supporting players and bits around the edges. The challenge with The Tempest is that if you don’t find yourself a compelling actor to play the role of Prospero, the thing’s not going to work. That’s the main stumbling block here. I’m sure George Muschamp is trying his level best here to deliver. It’s a great role for any actor, and a rare good role for an older actor. It may be a role Muschamp grows into over the course of the run. But opening night there was a struggle with lines. And if you don’t have the lines down, you can’t live inside them and be the character, you’re simply reciting. There aren’t any levels. There isn’t any nuance. It also makes you a hard person to share a scene with and do your best work. It’s hard to know how much of this is the actor and how much is the director, too. It’s a shared load. But with a cast this size, the director’s already got his hands full. They can’t give just one actor all their attention, even if that might help.